Scientists fear ocean acidification will drive the collapse of Alaska’s iconic crab fishery. This video was produced jointly with PBS NewsHour, using The Seattle Times’ reporting and video. DUTCH HARBOR, Alaska — For decades, the crab piled up in fishing boats like gold coins hauled from a rich and fertile sea. But the very ocean that nursed these creatures may prove to be this industry’s undoing. 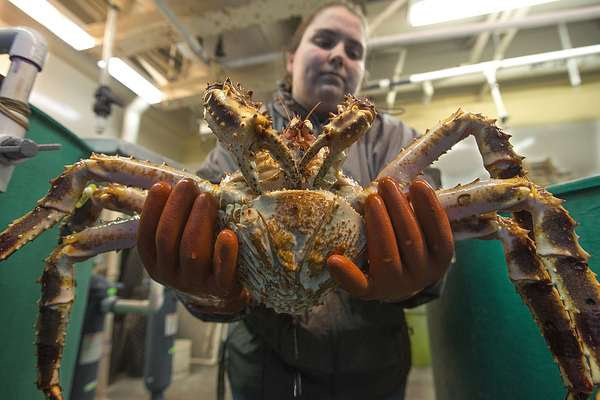 New research earlier this year shows that Bristol Bay red king crab — the supersized monster that has come to symbolize the fortunes of Alaska’s crab fleet — could fall victim to the changing chemistry of the oceans. 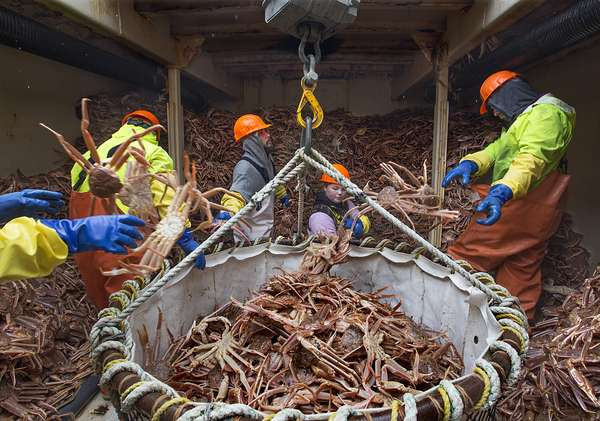 Barring a hasty reduction in carbon-dioxide emissions — or evidence that the creatures could acclimate to changing sea conditions — a team of scientists fears Alaska’s $100 million red king crab fishery could crash in decades to come. That grim possibility also raises alarm about the crab fleet’s other major moneymaker, snow crab. Early projections suggest trouble ahead for red king crab fishing. For decades, these storied crustaceans have drawn men and women from Seattle to the far reaches of the North Pacific. There, adventurers wrestled 800-pound steel cages amid raging seas and aprons of pack ice, hoping to strike it rich on a bounty of flaky meat and accordion legs. 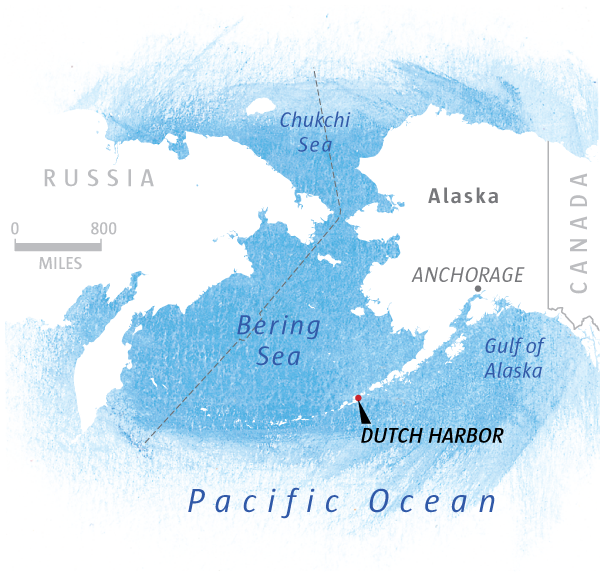 The emerging issues with Alaska’s crab underscore a predicament that stretches beyond the North Pacific. It gets to the difficulty of trying to comprehend the depth of fallout from ocean acidification. For reasons scientists don’t always understand, similar species, even those living side by side, often respond to changing water chemistry in remarkably different ways. Certainly the threat to king crab was unexpected. As humans pump carbon dioxide into the atmosphere, a quarter of it gets absorbed by the seas. That lowers the water’s pH and alters the availability of carbonate ions, which crab rely on to build their exoskeletons. Many crab species appear hardy in the face of souring seas, or at least not so frail. Exceedingly corrosive waters actually pump up Maryland blue crab to three times their size and turn them into voracious predators. Sour waters kill Dungeness crab, but far less often than Alaska red king crab. When Foy and his colleagues exposed baby red king crab to CO2 levels expected by midcentury, the young died more than twice as often as crab raised in normal water. When researchers boosted CO2 to levels expected decades later, red king crab died in far larger numbers. Such a loss would exact quite a toll. Red king crab is the showboat of the Northwest’s billion-dollar fishing industry. It is a television sensation and a marketer’s dream, its image emblazoned on bumper stickers, mugs, caps and T-shirts throughout the Pacific Northwest and Alaska. Alaska’s commercial crabbers also catch small loads of golden king crab and Tanner crab, but the real cash comes from just two species — red king crab and snow crab. 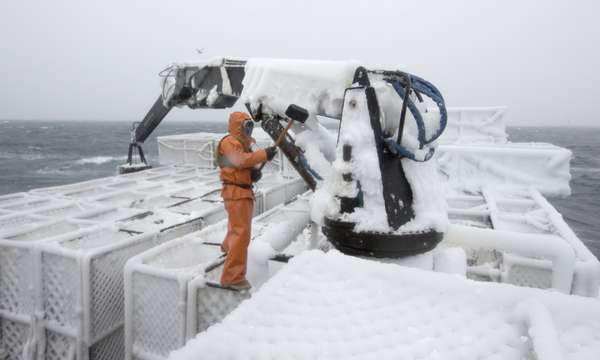 The 54 million pounds of snow crab caught in 2011 brought the fleet $115 million dockside. 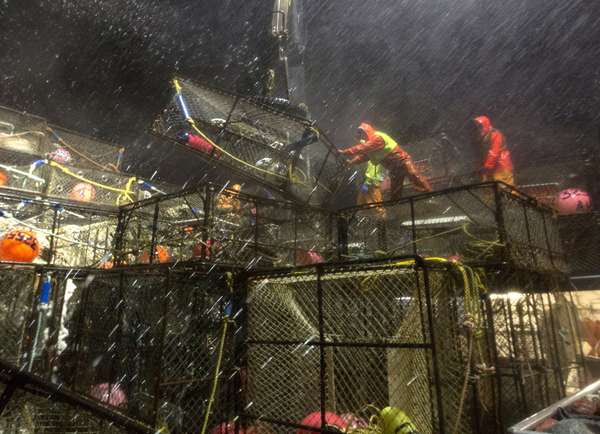 But a mere 14.8 million pounds of red king crab brought nearly as much — $92.5 million. And it can fetch $39.99 a pound at Pike Place Market. Crabbing attracts tough adrenaline junkies who disappear for weeks into the storm-buffeted frontier of the Bering Sea. They lounge in cramped quarters watching bad movies and wait for crab to fill their cages. Then workers scramble day or night on icy decks through stomach-churning swells, amped on coffee and nicotine. NOAA researchers are using Bob Foy’s research to develop models and a timeline that charts the potential collapse of king crab. But things are changing quickly. There’s no evidence that souring seas have yet altered wild populations — the most corrosive seas now occur at times when red king crab aren’t as susceptible. But Alaska’s crab industry has followed the science closely. Still, Jim Stone, of Lakewood, Pierce County, co-owner of the Bering Sea crab boat Arctic Hunter, is trying to remain optimistic. The research comes with plenty of caveats. No laboratory setting can ever properly approximate what happens in nature. Scientists are still conducting genetic tests to see if king crab might have the ability to adapt. “It’s not unreasonable to assume, for example, that they might move, that some form of rapid evolution will occur, that they may become somewhat more robust,” said Andre Punt, a University of Washington professor who worked on the research and assesses crab for fishing regulators. But the situation also might be worse than first thought. Souring seas could hit crab at several additional stages of development or attack their food. Ocean acidification is also not the only marine-world change under way. Warming seas, also caused by carbon emissions, could compound crab’s troubles. And while king crab’s future has everyone scrambling, the future for snow crab, which brings in more money, could be equally disconcerting. No two Alaskan crab species have responded to CO2 exactly the same way. They seem to react differently depending on where they live at certain stages of their lives. Golden king crab, for example, live extremely deep, below 1,000 feet, where waters already are naturally rich in CO2. That appeared to make them highly tolerant of sea-chemistry changes. Meanwhile, baby Tanner crab exposed to high CO2 died at a higher rate than normal — but nowhere near as often as king crab. Foy suspects that’s because young Tanner crab live in water that already experiences vast swings in pH, depending on tides, time of day and photosynthesis. Tanner crab probably are used to more variations than king crab, which remain on the outer continental shelf. 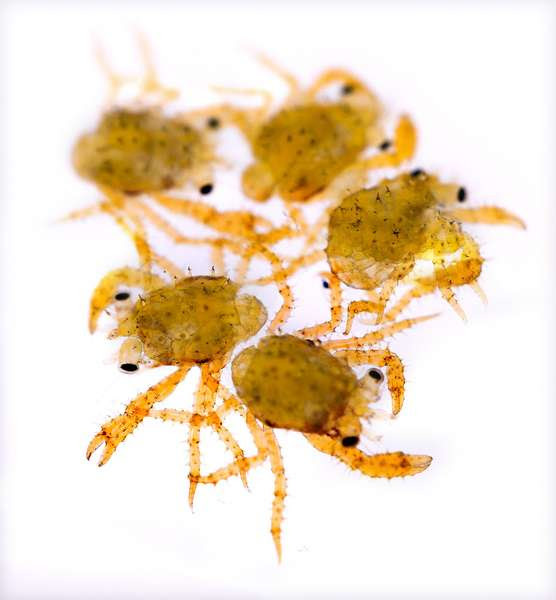 While snow crab are genetically similar to Tanner crab, their young spend more time at moderate depths. But with snow crab, scientists have struggled to perform extensive tests. The animals are just too hard to keep alive in the lab. It’s also hard to know how Foy’s results will translate to other species in other waters. A related king crab species has recently been seen by the millions in Antarctica, where it is devouring shellfish and starfish. Scientists are debating whether or not the crab is native. Will more acidic conditions kill these creatures or drive them out? Since they often occupy far deeper water, does that mean they instead might thrive? The weird purgatory for these signature creatures unnerved Brett Robinson, who captains Stone’s Arctic Hunter. 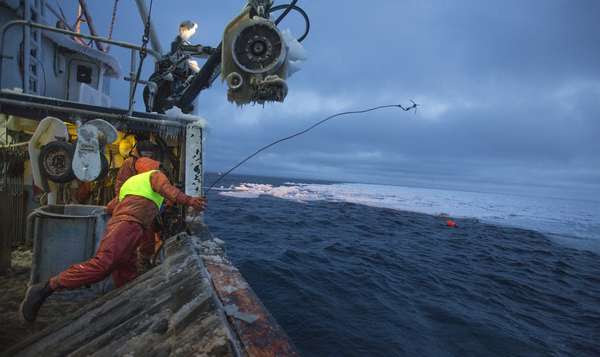 Scientists in Seward, a thousand miles from the fishing grounds, are working toward just that. For years, a shellfish hatchery has been learning how to raise baby king crab from scratch. The program started as an experiment to see if baby crab could be transplanted near Kodiak Island, where massive crab populations crashed in the 1970s and 1980s. 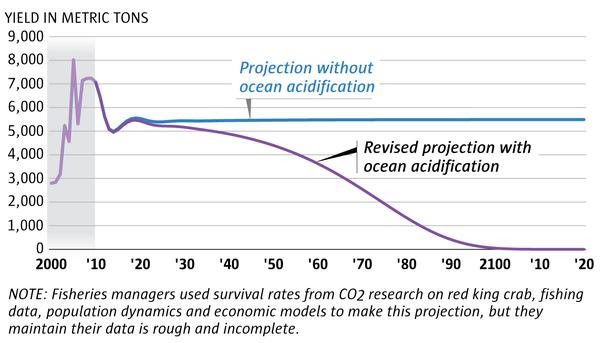 But the rising threat from acidification has insiders closely watching their work. Crab are most susceptible to corroding seas as babies, when a mere fraction of young survive even in perfect conditions. At the Alutiiq Pride Shellfish Hatchery, survival can be 500 times higher. Still, no one expects this operation could ever replace wild king crab. The orders of magnitude required to get enough crab to populate the Bering Sea would be ridiculous. But perfecting the science could provide options, such as the ability to repopulate a few previously devastated areas. 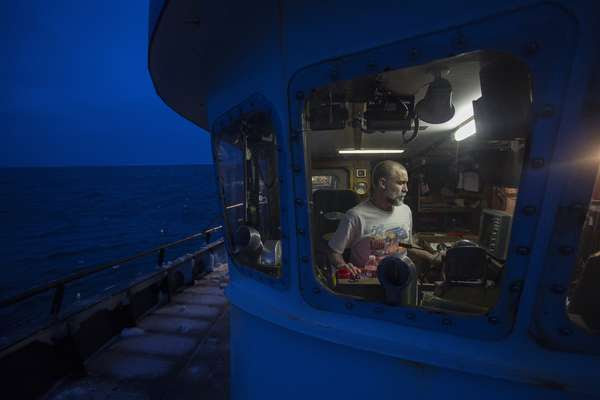 The idea that crab might be partially grown in a lab instead of the ocean frustrated Mizrain Rodriguez, another Arctic Hunter crewman. But it also saddened him to think that humans could be doing such damage to the sea.